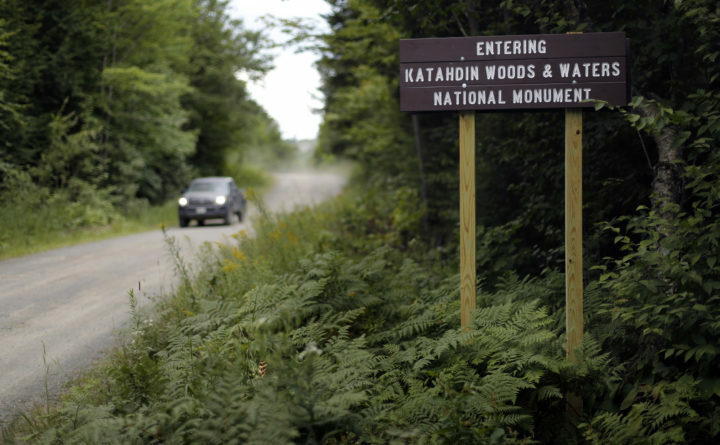 In this Aug. 10, 2017, file photo, a sign marks the entrance to the Katahdin Woods and Waters National Monument near Patten, Maine. We give the Land Use Planning Commission, which oversees zoning and development in the state’s more than 10 million acres of unorganized territories, credit for listening to public criticism of a plan to allow more scattered development in these areas. After public hearings and comments that were overwhelmingly negative, the commission revised its plan. But, the revisions didn’t go far enough. The original proposal to change this so-called adjacency rule would have allowed development as far as 10 miles from existing stores, homes or other public services, which the commission dubbed “retail hubs.” It said this would allow “economic opportunity that won’t compromise our natural resources in changing economic times.” It would have opened up nearly 2 million acres for potential development. After a summer of opposition, the commission came back with a revised plan that would allow development 7 miles from “retail hubs.” The revised plan would open 1.3 million acres, mostly in northern Maine, to development. The new plan would also still reverse commission rules to allow so-called “kingdom lots,” which are subdivisions of lots as large as 25 acres. It would also allow natural resource extraction and recreation-associated businesses in areas where they currently are not allowed. The revised plan, too, has been met with stiff resistance at public hearings and in written comments. One reason is that it remains unclear why the proposed changes are needed. Current LUPC rules require that new development be within 1 mile of similar development, hence the adjacency principle. The rules do not say how close the new development should be to a retail hub. The commission has presented little evidence that the adjacency rule is a hindrance to development in the unorganized territories, which are largely undeveloped and home to Baxter State Park, Katahdin Woods and Waters National Monument, miles of snowmobile trails, hundreds of ponds, offshore islands and millions of acres of timberland. Some land owners and developers have long complained that the commission is too strict and hampers the growth of second homes and camps, but there is little evidence that this is true. More than 17,000 acres of land near Moosehead Lake was rezoned by the commission nearly a decade ago to make way for resorts and hundreds of homes. The landowners, Plum Creek Timber Co. and now Weyerhauser, have done no development on this land (conservation easements did move forward). At first the recession was blamed for depressing interest in second homes in the area. Now that the economy has recovered, the land still remains undeveloped. A permitted subdivision east of Moosehead Lake also remains mostly undeveloped. Keeping development clustered makes sense from a variety of perspectives. It minimizes fragmentation of forests, recreation areas and wildlife habitat, and it makes it easier to provide services, such as fire protection. Allowing development up to 7 miles from the edge of an existing community could weaken these communities by encouraging residential development outside their boundaries, where they would not collect property taxes. Without a strong rationale for the proposed changes, and with so much public concern about the proposed changes and their consequences, the commission should set them aside.